In a world where almost everyone sits on a computer chair these days, it is becoming more and more important that the chair you use is ergonomic not only because poor posture can lead to upper and lower back problems along with neck pain. This guide will help you determine which chair to get based on how much money you have to spend. Please note though, just because a chair is the best in a £100 bracket doesn’t mean that it will be what you need to stop back pain from poor posture. For those types of problems, more expensive chairs are recommended. For chairs at this price range, they are all pretty much the same. Just look for a chair that has plenty of wheels so it wont tip, possibly neck support and good cushion. Something like an AmazonBasics chair. Moving into the next range, chairs in this category have improved quality and are known to last a little longer. There are still manufacturers that charge these prices for chairs that have lower quality parts but are still much better than their £0 – £200 counterparts. One of the most popular chairs in this range is the ANCHEER Ergonomic Chair. It offers a fire resistant mesh, good quality aluminium alloy legs, adjustable arm and back rests and also offers a sliding seat if you have longer legs. This is where you can buy the best of the best. There is a good choice in this range as everyone wants to be “The Best” but in my opinion, if you are going for excellent ergonomics, adjustability and breathability then a Herman Miller Embody Chair is the chair for you. They are made to be very durable and include excellent warranty. Read the brochure for more information. No Mans Sky fans have no doubt been part of a major hype in the last couple of months, and there has been a lot of mixed feelings since the release day. No only did some people have buggy loading times, some couldnt even open the game at all. This article was created by Alberto Statti. There were a lot of bugs when the game came out, even after it was delayed for a good few months. This has caused a lot of negative reviews on steam, netting No Mans Sky a measly 1 star within the first 6 hours of release. There was a problem with certain processors that didnt have SSE 4.1 support. This included many older processors for AMD and Intel, this meant the game wouldnt even launch for them. Next up, if you had the correct support on your processor, there was a good amount of people who got stuck on the initial loading screen where your camera just travels through the stars. This problem affected more people than the processor support problem. If you managed to get past those two hurdles, there was a problem with the game randomly crashing which affected a bunch of people too. As you can see, just three major bugs, all three of which were game breaking and required No Mans Sky developers to work through the night for fixes. And work through the night they did! Once the bug reports started coming in thick and fast for the No Mans Sky team, they began their bug findindg and fixing mission which had their first patch out within a day or two of release. These updates fixed the above problem and a lot more. They fixed an issue I personally had where alt-tabbing out of the game would stop the game working where it wouldnt be clickable in the taskbar again. There was an issue where sometimes the framerate would drop for no reason, this was also fixed with the first patch for me and allowed the game to run smoothly again. Patch 1.05 was centered around crashes again but more rare ones which not many people experienced such as crashing when doing a scan. Patch 1.06 was focused on fixing the majority of the problems encountered in the support requests fixing the even less common crashes and save game problems. There was also a number of people getting stuck in the space stations. Since they had fixed 99.99% of the causes of crashes, they then moved onto balancing and general bugs in patch 1.07. This patch fixed the likes of milestones not being tracked correctly, making it easier to scan certain creatures, reducing amount of times you get warnings in game etc. Overall, the support they have given since release has been amazing in my opinion, they dont have the biggest team around to bug fix, but there was a lot of patches in a short period which helped the majority of people play. Personally I think I got super lucky as I literally had one crash during my 45 hours of play time and it wasnt even within the first week of playing. As I mentioned, I have sunk 45 hours of playtime into No Mans Sky, so I have seen quite a lot of the content the game has to offer. 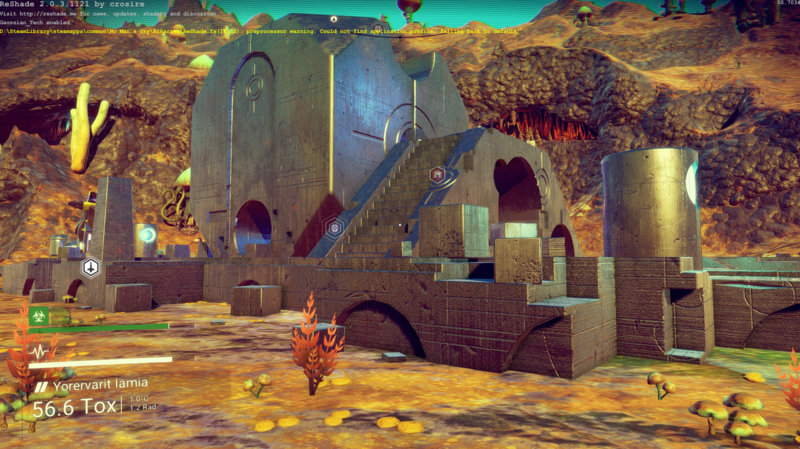 The content isnt completely unique on every planet as you may seen the same type of mushroom monsters and the same structures on different planets but overall I feel like I havent seen the same stuff all the time and everything is different enough to be considered unique. 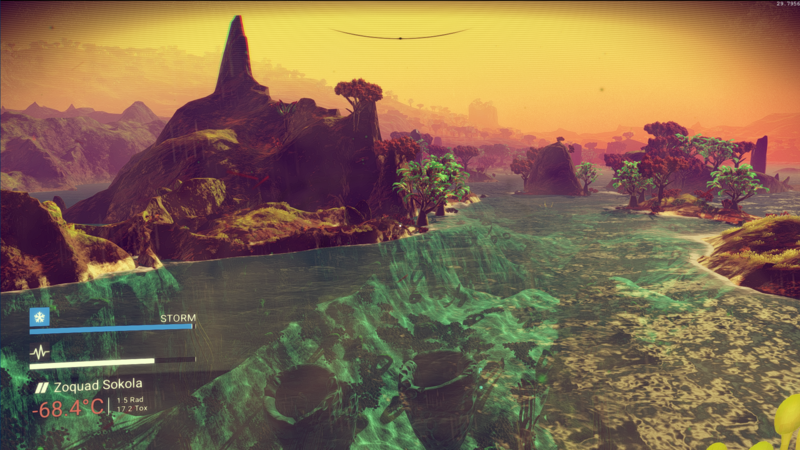 The game worlds themselves are always unique and some that contain life and greenery and water look pretty amazing as you can see below. After you have had your fun playing the game and have a good grasp of everything, you can take the game one step further and install a bunch of mods, one of which is called Reshade, it allows you to make the game SO MUCH better looking by removing certain filters, and the slight blurr on everything (maybe the games built in AA). Another great mod is the Project Potato which does exactly as you imagine, it makes the game so low quality that it can run on a potato. This is not only great for those on really bad quality PCs and Laptops but it also adds a new way of playing as it resembles Nintendo 64 graphics to me. Finally, I personally installed the Deep Space mod which allows you to jump 1000x further with your warp drive. I got it because with my 45 hours of gameplay, I had only travelled 10,000 light years towards the center and it was still 140,000 light years away. I dont mind the usual jump distances but at my current rate it would have taken me another 10 years to get there! I believe that the amount of conent in the game is worth the costs I paid. Naturally there will be dissapointed people as there usuallly are, but if you didnt read into every interview, every picture of the game and join the hype train like everyone else and just enjoyed the game for what you got rather than what you didn’t then you would have had an amazing time just like myself. I’m looking forward to see what No Mans Sky has instore for the future as I may come back if they bring out some sort of questing system. Til then, have fun. Okay so let me explain each clip if you are on mobile and are conserving data. The first clip is of me with low health in an AT-ST, naturally I get his with a missile so I have to abandon ship. As I abandon ship I turn to my left and run into the left of the AT-ST I jumped out of, so I move a bit more to the left to go round it and it falls on me and my camera bugs out and I cant move until it de-spawns. Clip 2 is a lot better looking. I initially pick up a powerup and its a thermal imploder (yes!). I throw it at the first person I see in a tunnel and get a nice kill with it. I process to move into said cave after finishing off another unlucky soul. A couple of clips into what I thought was a person but turns out to be a shiny rock and im in the cave in another fight then another then another. As if god was smiling down upon me, I got 3 kills without taking a hit. Called it a day after that before it got ruined. Clip 3 had me shooting randomly at enemies littered about. I make a slight retreat behind a rock and as you would have guessed it, get stuck on that damn rock. I managed to jump over it and throw a grenade. The grenade actually killed someone (pure luck) just the AT-AT looks at me and blows me into oblivion. Clip 4 consists of me being an idiot again. I was keeping it safe staying back waiting for someone to come to me as I was defending. But nope, not good enough for me, I had to run in. First thing I see is an AT-ST so I hightail it out of there. I see someone between 2 shipping crates but they aren’t looking and I assume they will go in a different direction to me. Nope they manage to get right up to, I crap my pants, miss my shots and get killed. The finally clip is me staying back defending again but this time I learned my lesson and dont run in. Instead I get splash damage killed by someone on the other side of the planet. FML….. There have been 3 expansion packs released for World of Warcraft in the last 4 years, all of which need to be purchased by players that are already paying a subscription to Blizzard. This seems to have angered a lot of fans who believe these expansions haven’t offered much in the way of added gameplay, and aren’t very good value for money compared to the base game and earlier expansion packs. The content provided is scarce and they lack uniqueness making fans feel they are receiving a rehash of old content. In today’s economic climate people aren’t so keen on paying subscriptions for a single game, you wouldn’t want to have to cancel your favourite game because you were having a tough month. The micro transaction format is much more popular nowadays and brings in significantly higher revenues. Blizzard seem to be heading in this direction with its newer releases and could considering changing WOW to a micro transaction or free to play format in order to revitalise the game. When World of Warcraft first launched it was perfectly acceptable to let your child play online with his friends and talk to them via a headset. As time has passed parents have become savvier to the dangerous of the internet and the abuse that can be flung around while playing online. A raid that is going badly can result in a lot of anger and aggression, and language that is definitely not PG friendly. This had led to many parents stopping their children and young teenagers from playing the game. There have been many game play changes over the years some have been welcomed and some have not. Blizzard have altered a lot of the class specification in an attempt to make all classed equal, but this has taken away from the uniqueness of each class, and the reason you felt drawn to be a certain class to begin with is taken away. This lack of distinctiveness leaves the game feeling bland and lacklustre.